Investors have made HUGE capital gains in the last decade in energy metals—think uranium in 2007-2008, lithium in 2011 and lithium again in 2016. In 2007 I owned a large position in a junior uranium stock that went from 25 cents to $2.50. Last year I owned a lithium stock that went from 30 cents to $2.80. There’s going to be another big run in an energy metal in 2017-2018—and like lithium this will be driven by demand from Electric Vehicles—EVs. This year, it’s going to be COBALT—the blue metal. I’m certain very few of you know anything about cobalt, even though it’s already in almost every personal electronic device to which we have become addicted. You’re probably within three feet of cobalt right now. That’s just a taste of how much the world uses. 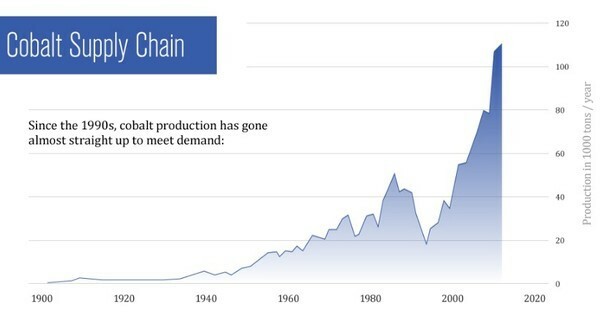 Add the rapidly growing global market for EVs onto that steadily increasing demand…and the cobalt market gets very interesting…for everybody: suppliers, end users and investors. 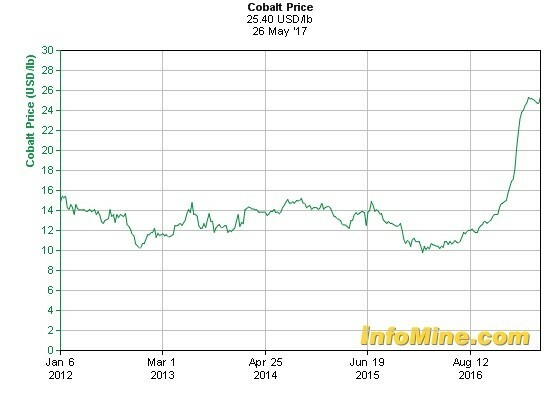 To me, the interesting thing about the 150% price rise in the chart is…the cobalt market was actually mildly oversupplied last year, producing a few thousand tonnes of excess metal. But investors are clearly looking ahead. Cobalt supply is much precarious than any other metal in the EV supply chain. And that should make the price increases be potentially even higher. Getting a large supply of ethical cobalt is not easy. And then at the very end, I’ll tell you how I intend to profit from cobalt. Investing in this space is much more difficult than I expected—because there aren’t any cobalt mines. I’ll outline worldwide cobalt demand first. Cobalt is a hard, lustrous metal that sits between iron and nickel on the periodic table. Its key characteristics – a high melting point, high energy density, and ferromagnetism – make it perfect for two things: battery cathodes and superalloys. Superalloy demand for cobalt will keep rising slowly. The battery market, on the other hand, is ravenous. Caspar Rawles is the cobalt analyst at Benchmark Mineral Intelligence in London England. His is the only firm that specializes in collecting price data from the battery supply chain for the EV industry. The driver here is electric vehicles. In Beijing, Mexico City, Lahore, New Delhi, Moscow, Guatemala, Istanbul, Los Angeles, and beyond, people are choking to death on smog. That is why the governments of 14 countries are collectively targeting 13 million electric vehicles in circulation by 2020. That’s a five-fold increase. And it’s possible because, after being prohibitively expensive for years, battery costs have come dramatically, so much that we are now at the tipping point where electric vehicles are cost-competitive with regular cars. To supply the huge demand that comes from outfitting millions and millions of new EVs, the world needs a lot of batteries. We’ve all heard about Tesla’s gigafactory in Nevada, but in fact there are 12 such gigafactories being built around the world. Those 12 gigafactories will need an immense amount of cobalt. Cobalt also drives the batteries in most devices, from laptops to phones. It also powers tools and lights. The reason for ALL of this: no other battery chemical comes close to cobalt’s energy density, longevity, and safety. That’s why cobalt production has gone almost straight up in the last 20 years. Now we’re talking about supply, and this is where cobalt gets REALLY interesting. Almost two-thirds of the world’s cobalt comes from the Democratic Republic of Congo, or DRC. This brings up both political and ethical issues; mining companies are under huge pressure not to use conflict minerals. More than half of mined cobalt is refined in China—who need a lot of cobalt themselves. And to make things more fragile, 98% of cobalt is produced as by-product from nickel and copper mines. That means it is very hard to increase cobalt output – it is totally dependent on the economics of other metals. That means cobalt supply hinges on a highly unstable country (DRC) while refining requires the Chinese – who need a lot of cobalt themselves – to play ball. Now we get into the politics. Analyst Rawles from Benchmark says these are real concerns—for everybody. Spot prices for cobalt can be almost 50% higher than contract prices, Rawles added, telling me about one producer who had a contract to sell at $21/pound but was selling spot at $30/lb. So right away the Market is seeing some price tension. Over 60% of the world’s cobalt comes from the Democratic Republic of Congo. Three-quarters comes as a by-product from copper or nickel mines where production is only as secure as the host country. The other 25% of Congo’s cobalt is mined “artisanally”, which means it comes from small mines that are often very unsafe. Thousands of under-age workers are used, sent down into hand-dug tunnels and shafts that can and do collapse—to pull out bags of rock. Several media stories have exposed this practice. This is starting to change. In early March, Apple stopped buying cobalt mined by hand in the Congo, saying all small mine suppliers will have to meet its workplace standards. Other companies have made similar noises. The question is: if major companies move to cut out the Congo, where will they get their cobalt? Rawles says it’s a tough question for the industry. He says no other country produces even 10% of the world’s cobalt supply. Now, we haven’t even got to China yet. They refine just over 50% (~52%) of the world’s cobalt, and Rawles says that could potentially jump to 62% with some of their recent acquisitions in the space. The concentration of refining capacity in China “is certainly a point of concern” for the industry, says Rawles, but adds they view it as a shared risk amongst themselves. The investment world is taking notice. High-profile investment funds like Switzerland’s Pala Investments and China’s Shanghai Chaos Investment are so convinced a supply shortage will send cobalt’s prices through the roof that they have already started stockpiling cobalt metal. If the price more than doubles and investment banks start stockpiling metal in expectation of a tight market, what will happen when the market is actually in deficit?? Since 98% of cobalt comes as a by-product from copper and nickel mines, it’s tough to increase production. Planned new mines might be able to meet demand…if everything goes according to plan. That’s a rarity when it comes to building mines. 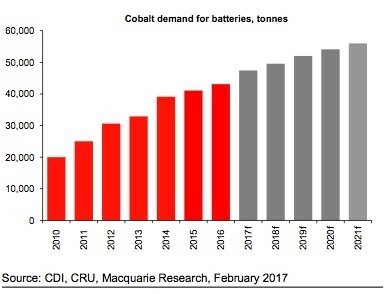 Any supply disruption will cause cobalt prices to spike. And when 64% of supply comes from the Congo, 50% is refined in China, and 98% comes as a byproduct, disruptions are almost guaranteed. That is why more secure supplies – from mines outside of the Congo or from dedicated and responsible new cobalt producers, for example – would be very welcome news to cobalt consumers. That’s my segue to tell you my idea on how to profit from cobalt. I’ll explain it in detail in my next story. Next post: If Frac Sand is So Hot—Why Are Sand Stocks So Cold?